My recent analysis of draft picks and their relative value was complicated by the problem of every team’s tendency to regress to mean. Good teams appear to get worse, and bad ones appear to improve. Because draft picks are allotted according to team record, it is very difficult to tell whether the change team in record was due to the draft picks. One factor dominates the equation when trying to predict the following year’s record with draft values—the previous year’s record. 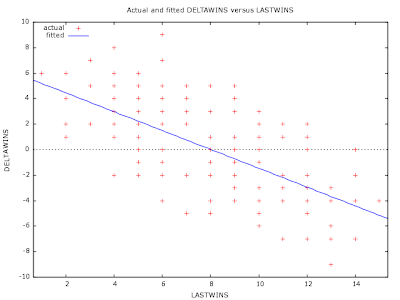 Teams with high numbers of wins tend to have fewer wins the following year, and teams with low win totals tend to have more wins in the next season. This tendency is strong. In fact, if you look at a graph of every team’s change in wins from year to year (DELTAWINS) vs. the team’s win total from last year (LASTWINS), you see a very strong trend towards mediocrity, i.e. regression to the mean. The graph includes all teams from 2002-2006. In fact, between ‘02-’06 no team that had 13 or more wins improved their record the next season, and no team with 3 or fewer wins got worse. Only 1 team with 4 wins earned fewer wins, and only 2 teams with 5 wins got worse. The reasons for teams to tendency to regress to the mean are likely the obvious ones. First, there is the scheduling system. Each team is given 2 strength of schedule games in which they play the teams that finished in the same order in their respective divisions. First-place teams play the other first place teams, second place teams play each other, and so on. Additionally, there is the draft which allocates draft position in reverse order of win-loss records. Lastly, there may be effects of salary cap boom/bust cycles in which individual teams load up on talented and costly players by amortizing signing bonuses into out-years. This causes teams to 'purge' their rosters of those players, and others, to allow cap room for the dead weight of past signing bonuses. So are we assuming that turnovers are random? I looked at how many seasons it takes for certain teams to get to .500. Some franchises took a statistically significant long time to get there (either from above or below .500). I wonder how that correlates with turnovers. Have you looked at team progress over multiple seasons, including a dummy variable for time? I haven't looked at time spans longer than 1-year. But a longer longitudinal study of turnover stats might be interesting. Justin-great article, but be careful when looking at large data sets for individual instances of significance. I don't doubt that some teams are systematically and organizationally flawed over the long-term--Cardinals, Lions, Bengals perhaps. But if you look at enough teams over enough possible periods of time you'll find significance in 1 out of 20 cases even when there really is no systematic cause (a Type I error). A quick clarification about "regression to the mean:" As Phil points out about a .260 hitter, we wouldn't always predict that he will regress to the MLB mean, but to his own true intrinsic mean, whatever that happens to be. The same goes for football teams. Regression to the mean doesn't always mean 8-8, but rather regression toward a team's own mean based on it's fundamental talent and ability levels.